I've added two shots from the series of photos of the same individual taken that day. I hope this may help. This looks like a piece of artwork (drawing, painting, mural, etc.) to me... Am I confused? Is this actually a photo of a live specimen? The spider was on a sliding glass door, with sunlight in the background. I used the flash in an attempt to illuminate the silhouetted/backlit spider. The red stripe is an adhesive warning tape placed on the glass door to prevent people from accidentally walking into it. Sounds like it was a tough lighting situation, but well worth the effort to get these intriguing images for Jay to ponder over. at least the pose is natural. Just looks like some very difficult lighting. I can see that flash was used here, but the spider is still backlit, so it may have been on a lighted or reflective sign of some sort. 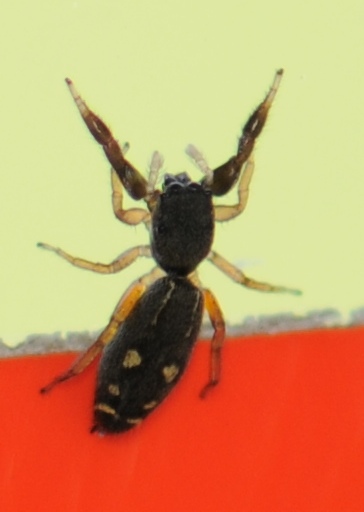 In any case, I think this might be the first photo I've seen of a live Metacyrba punctata. I added a link to the Edwards review on the Metacyrba guide page if anyone else wants to offer an opinion. I'll move to Metacyrba for now. but vaguely resembles some of our images of Metacyrba. However, I can't find one with those interesting markings at the hind end of the abdomen. May well be another genus entirely... Please wait for one of our salticid experts to comment. could this be a pseudoscorpion?